Given a cross-sectional diagram of two rock outcrops (From Earth: Portrait of a Planet 4th edition by Stephan Marshak. Copyright Â 2012, 2008, 2005, 2001 by W.W. Norton & Company, Inc. Used by permission of W. W. Norton & Company, Inc.), Part 1 of this activity asks students to sketch a fault structure that would explain the rock configuration. Labels for all important parts of the fault are required (hanging wall, foot wall, arrows indicating movement and the maximum stress direction). The fault must be identified as either normal or reverse. Only one of two possible solutions is required. 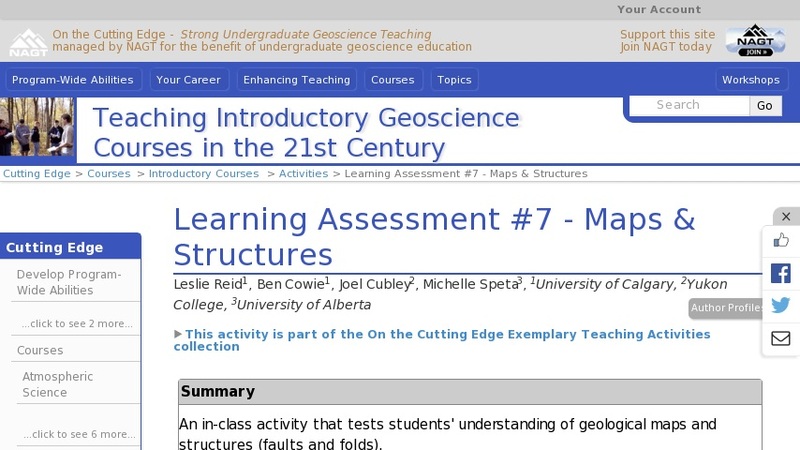 Given a map template, Part 2 asks students to sketch a geological map of the outcrops based on their fault from Part 1. Required elements include all lithological contacts, strike/dip symbols, structural labels and a proper legend. Part 3 of this activity gives students the same schematic cross-section as in Part 1, except now they have to draw folds that would explain the rock configuration. Labels for the hinge line, axial plane and maximum stress direction must be included.